I feel like I just hit the jackpot. The company that owns the Mazda dealership I work at has sold the franchise to another company and will no longer be Mazda come Monday. I decided to stock up on some parts and take advantage of my employee discount while I still can. I asked for non-value line oil filters and 3 times the parts guy asked me why I wanted them because they perform the same. I insisted and he said that they had 5 left, so i got all of them. When I looked in the box i was surprised to see 5 PE01-14-302A made in Japan filters! Based on this thread, I bought a set of allen/hex bits for my ratchet so I'd be able to torque the Mazda oil plug in my 2018 CX-5 , I think even before I bought it. The dealer through in the first oil change for free. So I hit 12,500 miles and did the first change myself. Boy was I surprised to discover that the oil pan used a 17mm flange head hex bolt. And I had to get a bigger ratchet handle to loosen it, because it was on so damn tight. The aluminum washer was crushed to the point that it was nominally the same OD as the bolt, and was stuck to it. I had to use pliers to un-thread the washer from the bolt to put on the new one. The Mazda washer is smaller OD than the bolt flange, and torqued properly, it shouldn't have a larger OD. I'm not sure if the Mazda dealer tightened it with an impact wrench, or what. There's no way they used the 28 lb-ft or whatever it is that the WSM recommends. I used the WIX with Castrol Magnatec 0-W20 from Amazon. PE01-14-302A-MV is apparently what the dealer used. Yeah I use a breaker bar to remove my drain plug...needed or not. I usually torque down to 25 lb ft...if I recall. Why the surprise? The hex size itself is 8mm right? Another bad dealer experience! Unfortunately this's not uncommon and I have learned the lesson too. I usually don't go to dealer for service unless it's warranty related. I've never asked for free first oil change because this kind of thing could happen. I want to check things out while I'm under the chassis of a new vehicle, and would like to know what kind of oil filter installed from factory. 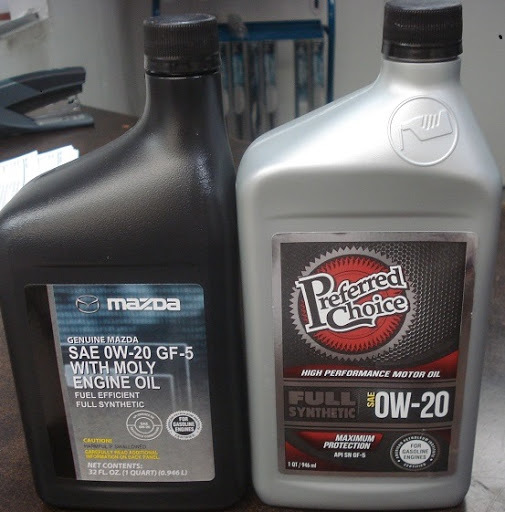 Besides, often times we don't know what kind of oil dealer uses, and "Preferred Choice" oil my Mazda dealer uses definitely is not the preferred oil by me! It's interesting that Mazda has changed the drain plug from Allen drain plug to hex head drain plug. I wonder the new hex head drain plug you now have is a flange bolt with larger diameter rim or is like the one without larger rim selling by Mazda dealers? Or is it possible for some reason the tech doing your oil change screwed up your OEM Allen drain plug and replaced with an aftermarket hex head drain plug? If I remember it correctly, the black end tip of the OEM Allen drain plug is not a magnet. It's black paint applied from inside of the oil pan while the drain plug is installed and stick out. But I could be wrong as I didn't test it while the plug was out. See my previous post showing different types of drain plugs. And CX-5 uses 8MM Allen drain plug since the beginning and a 8MM Allen hex bit, showing below, is needed to change the oil. The change to 17MM hex head plug is a surprise! Can you confirm the p/n of your OEM oil filter from Med Center Mazda actually is 1WPE-14-302 from Thailand instead of PE01-14-302A from Japan? I just got an OEM oil filter from my Mazda dealer and Mazda parts system has superseded Japan made PE01-14-302A to Thailand made 1WPE-14-302. We appreciate your detailed oil change write-up with many pictures and a picture is worth a thousand words! BTW, I use Craftsman ⅜" drive 8mm hex bit socket for drain plug so that I can conveniently use a ratchet or use a torque wrench if I want to. As I said, it is a flange head, like the small middle picture comparing the plug types, so there is plenty of face for the washer. It's an outie, not an innie. The flange of the drain plug is wider than a new Mazda aluminum washer, but the washer I removed from the car after the dealer change had apparently been "crushed" into a much wider OD, smaller ID and was consequently thinner and difficult to remove from the drain plug/bolt. It also seems that the dealer omitted one of the two plastic push clip rivet fastener retainers. I didn't request the free oil change, the dealer does it for everyone, and I thought it would be good to get at least one multi-point inspection or whatever they call it, in case there was something unusual that jumped out at them. I'm not familiar with Mazda's, this being my first. Also it was a chance to get a feel for the service department. Generating a small amount of goodwill can't hurt either. Otherwise, I prefer to do my own maintenance and part swapping repairs. Asked the dealer what oil they used. It was a big name, maybe Mobile 1. Not Castrol or Mazda Moly. And I assume I imagined it, but seemed my mileage got a little worse after the 1st oil change. Your Allen hex bit set can also be used for any strut replacement. I have several Allen hex bit sockets from Craftsman including the 8MM. But I just bought a 6-piece Allen hex bit socket set for $5.99 from Harbor Freight Tools because I needed a 5MM for the strut job on my Honda CR-V, and a single Craftsman 5MM hex bit socket from Sears would cost more. Actually I found this Pittsburgh set with lifetime warranty from HFT has pretty good precision on size and quality. I like it a lot especially for the price! Thanks for clarify the drain plug. It's strange that you are the first one finding out the drain plug now is the regular flange bolt type. Or may be Mazda changed it starting from 2108 MY with new cylinder deactivation? At lease it's not the type sold at Mazda dealers. 1. Oil should be drained after it’s been heated up to operating temperature. It should be very hot when draining. That helps get it all out. Don’t drain cold. 2. Regarding Fram, I used their filters exclusively on my 2003 Toyota Corolla which I just got rid of at 280,000 miles (and not due to anything related to the engine) as well as my 2011 Hyundai Sonata with 180,000 on and that my daughter is now driving. No reason from my experience to be afraid of using Fram filters. That being said I’m using OEM on my 2019 CX-5 GTR as they are about the same price as Fram and can get them easily from my dealer. Is there a "Value" line OEM oil filter for 2.5T turbo? What is the part number of the OEM oil filter you use on your 2019 CX-5 GTR? 2.5T uses different oil filter with different part number from 2.5L and the list price is much higher than the OEM filter used for 2.5L. Different specs but the size is the same which are interchangeable size-wise between the two. Fram oil filter has been criticized with poor quality many years ago. The quality may have been improved for recent years, but the bad reputation is still there. Besides, one Fram oil filter or many other after-market oil filters all claim to fit EVERY 4-cylinder from Mazda including SA-G 2.5T but there're at least 3 different OEM filters with different specs for those Mazda engines. How is it possible one filter can meet different specs of 3 OEM filters? This simply doesn't add up. I can't think of the last time I drained the oil on any of my rigs hot. I usually park in the garage overnight and drain in the morning. I've done this for 30 years now. my 18' cx5 is also with a flange hex bolt type plug. Havent changed 1st oil yet but I looked. So assuming all new cx5 now use this type. The better school of thought for draining when warm is that the contaminants are still suspended in the oil rather than to have settled down to the bottom. That being said, i do it either way. Good point... probably my leftover behavior from some vehicles of past that would seem to take 20 minutes to get an accurate reading on dipstick after being shutoff. That and I don*t particularly like working on hot motors.